During our holiday in Malaysia last month we drove up to Genting Highlands as the 2nd out of 3rd stop along our road trip. During our 2 days stay there the kids enjoyed themselves in the indoor playground. Tiger girl is too young to go on certain rides on her on and was lucky that Doggie boy could accompany her for a go on the bumper cars. She happily got herself strapped in while her brother took her for a spin. The kids posing for a picture. They wanted to go on a ride again after having so much fun on the bumper cars but I declined. 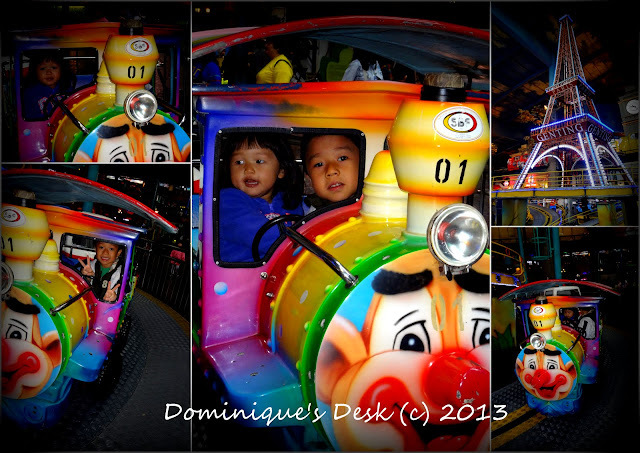 I felt that they should maximize their 4 ride tickets which we purchased and chose another ride instead. The 2nd ride which they they hopped on was this ” Thomas like train” which sped around the Eiffel tower. Choo..Choo!! It was freezing cold outside and the fog was really dense. It was a pity that the kids couldn’t know try out any of the outdoor rides. Maybe next time when we next visit Genting Highlands. Have you been to any indoor theme parks lately?